Congratulations on getting your new puppy! Although house-training probably won’t be the first thing on your mind, and you’re probably more focused on introducing your new pup to your family and friends, the basics of house-training really should start as soon as your puppy arrives home. This will make it easier in the long run, as your puppy will know what you expect from them. 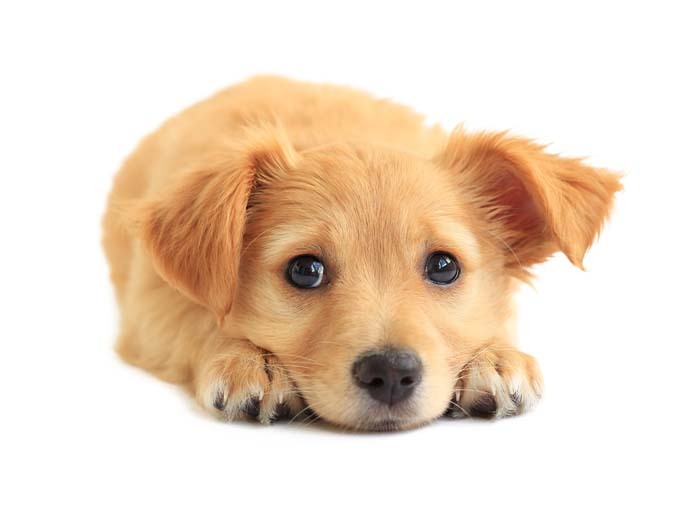 Puppies urinate frequently, and you’ll need to anticipate their needs for successful house-training. A puppy will ‘want to go’ when they look around anxiously, walk in circles, or sniff in suitable corners looking for a place to eliminate. House-training a puppy takes time and patience. But your puppy should quickly learn where they should eliminate when you start rewarding them for eliminating in the right place. To make the process as successful and efficient as possible, we’ve put together this guide that features everything you need to know on how to house-train your puppy in their first weeks at home. You can paper-train puppies on newspapers or dog pads. Give them lots of praise and affection when they use the newspaper or dog pad, and ignore them when they don’t. Over a few days, move the newspapers or dog pads towards the door leading to the backyard and then out into the yard. Also take out a small piece of soiled newspaper or dog pad – your puppy will recognise its own scent and want to reinforce it. On the other hand, you can try crate training, where you can teach your puppy to wait in the crate before you take them outside to eliminate. You should take your puppy to their elimination area within 5-10 minutes after waking up, eating, drinking, and playing. Most puppies need to eliminate every two to three hours during the day, so give your puppy an opportunity to relieve themselves at least every two hours. As for night time, take your puppy to the toilet two or three times if they need to, until they learn to hold on till the morning. You need to supervise your puppy indoors so you can see when they want to eliminate (eg. they’ll walk in circles, squat, sneak off, or head to the door). Then you can quickly take them outside to their elimination area. If they start to eliminate indoors, use a verbal warning and quickly take them outdoors to the right spot to complete the act. Attach a remote lead or training collar to your puppy so you can use it to supervise them during the housetraining. When you can’t supervise your puppy, you should confine them to the play pen, puppy crate, kitchen, or laundry. But first, make sure they’ve had a chance to eliminate, and had sufficient play and exercise before confining them. In a small pen or crate, your puppy will have enough control to keep the area clean. And when it comes time to release them from confinement, you should take them to their elimination area straight away. If you’ll be keeping your puppy in a big area like the kitchen or laundry or you’re going to leave them there for a long time, they may not be able to control themselves. So cover the whole area, except for your puppy’s bed and feeding spot, with paper for elimination. You can teach your puppy to go to the toilet on cue. As soon as they start to squat or show other pre-elimination signs, use a command such as ‘go now’, toilet’, or ‘wee time’. They’ll soon learn the association between the command and toileting. After your puppy has woken up, eaten, or played, say a command so they know it’s okay to relieve themselves. If they go, praise them, and if they don’t, ignore them. Once your puppy has toileted in the right place, give them lots of praise (eg. saying ‘good dog’ in a pleasant tone of voice or patting their chest), a food treat, or a chew toy as a reward. You should give the reward straight after your puppy has toileted and not when they’ve come back inside the house, or they won’t make an association between going to the toilet in the right spot and the reward. If you see your puppy toileting in the wrong spot, use a stern voice to tell them off and take them to the right spot immediately. If you happen to find a puddle, ignore it. Don’t tell your puppy off after it has happened, or they won’t know why they’re being punished. Just clean up the mess thoroughly to remove the odour, so that your puppy won’t go to the toilet in the same spot in the future. Having a house-trained puppy is an achievement to be proud of as a dog owner. If your puppy knows exactly where they should do their business, you can let them wander around the house without worrying about them eliminating in the wrong places. But if you can’t always supervise your puppy and they don’t like confinement, you can consider hiring a professional pet sitter to house-train your puppy while you’re away. Lonely Pets Club can help you achieve a house-trained puppy in no time.